Super nice hosts. Beautiful mosaics in the rooms. Lovely pool and views. We absolutely loved everything about the location and villa. From the beautiful views of the sea and mountains, to the lovely cats. From the beautifully designed interior, to the comfy beds. From the very friendly hosts, to the many travel tips we got from them. We did not use the pool and the Jacuzzi, but will for sure do this on our next trip to the Olive Grove. Beautifully appointed studios in a gorgeous location. Host welcoming and helpful. The setting, the accommodation and above the couple running it. They were very helpful and knowledgeable. The villas are very well set out, the view is stunning and olive trees look splendid at night. The snow capped peaks looked amazing in contrast to the blue sky and panoramic sea below. Everything was perfect-location and accommodation. Value for money. Wonderful place to stay. Nature all around, view to backyard and to the pool. A five minute drive from the main road and stunning view to the sea. The design made my day. I was only sad that I didn't have the time to stay one more night. Definitely going to visit again. We had an amazing stay at the Olive Grove Boutique! The property is beautiful, and the rooms are impeccably designed (and super comfortable)! Though it is located a few minutes drive up the hill from the main drag of Kardhamili, parking was easy both in town and at the property. But best of all, Annamarie and Robin were absolutely wonderful hosts! We loved our stay here and would highly recommend it! Lock in a great price for The Olive Grove Boutique Villas – rated 9.6 by recent guests! One of our best sellers in Kardamyli! Located in Kardamyli, The Olive Grove Boutique Villas features an outdoor pool and offers accommodations with a fully equipped kitchen and panoramic views over the sea or the garden. Free WiFi is available throughout and guests are benefited from a free private on site parking. Villas at Olive Grove will provide you with a flat-screen TV, DVD player and iPod docking station. The kitchen is fully-equipped with a microwave, oven, fridge and a hob. Also features a shower and a private bathroom which comes with a hairdryer. The town of Kalamata is 22 mi away, while Kalamata Airport is at 28 mi. Within 3.7 mi, you can also visit the seaside village of Stoupa. This property is also rated for the best value in Kardamyli! Guests are getting more for their money when compared to other properties in this city. When would you like to stay at The Olive Grove Boutique Villas? Overlooking the sea from its balcony, this tastefully decorated villa comes with a fully equipped kitchen, living room with flat-screen TV and DVD player and free WiFi. Overlooking the sea from its balcony, this tastefully decorated villa comes with a fully equipped kitchen, living room with flat-screen TV and DVD player and free WiFi. King-size bed can be split to offer twin bed accommodations if preferred. This tastefully decorated villa comes with a fully equipped kitchen, living room with flat-screen TV and DVD player and free WiFi. It opens out to a garden-view balcony. King-size bed can be split to offer twin bed accommodations if preferred. This tastefully decorated villa comes with a fully equipped kitchen, living room with flat-screen TV and DVD player and free WiFi. It opens out to a garden-view balcony. One of the south Mediterranean's best-kept secrets - Kardamili is a beautiful seaside village located in the Mani, a stunning region in the southern Peloponnese. Set dramatically against a backdrop of aqua-blue waters, majestic cypress trees, olive groves and snowcapped mountains, it is one of the prettiest of villages that overlook the calm seas and splendid sunsets of the Messinian Gulf. 3 hours and 30 minutes' drive from Athens or the port of Patras, and just 35 km from the nearby city of Kalamata, it remains one of the south Mediterranean's best-kept secrets: an exclusive, small, unspoilt resort with traditional stone architecture, lush gardens, a picturesque harbour and fantastic beaches. Kardamili offers several lovely beaches and is only a ten minute drive from the sandy beaches of Stoupa. House Rules The Olive Grove Boutique Villas takes special requests – add in the next step! The Olive Grove Boutique Villas accepts these cards and reserves the right to temporarily hold an amount prior to arrival. Please note that there is an extra charge for linen costs of €30.00 per week for the third and the fourth guest. Please note that a mid week change of linen is available at an extra charge of €30.00. Please inform The Olive Grove Boutique Villas of your expected arrival time in advance. You can use the Special Requests box when booking, or contact the property directly using the contact details in your confirmation. Nothing. It was exactly what we wanted for our stay. The views,attention to detail of the studio apartment and support from the owners/hosts. The Small details such as providing a bottle of olive oil in the apartment, books and walking maps to answer your questions and help all aspects of your stay are very special and help you get the most from the property,location and surrounding area. The hotel is gorgeous yet intimate situated up in the hills above kardamyli with a stunning view. Annamarie and Robin are consummate hosts. They love the area and were incredibly eager to share it with us. They gave us fantastic advice on what to see and all of their recommendations were spot on. We also took a mosaic class with Robin that was really great. He is a patient and skilled instructor. My wife and I were able to create pieces that turned out so much better than we could have hoped. What a great memento of our trip. We can’t recommend the Olive Grove highly enough. Don’t miss this gem! 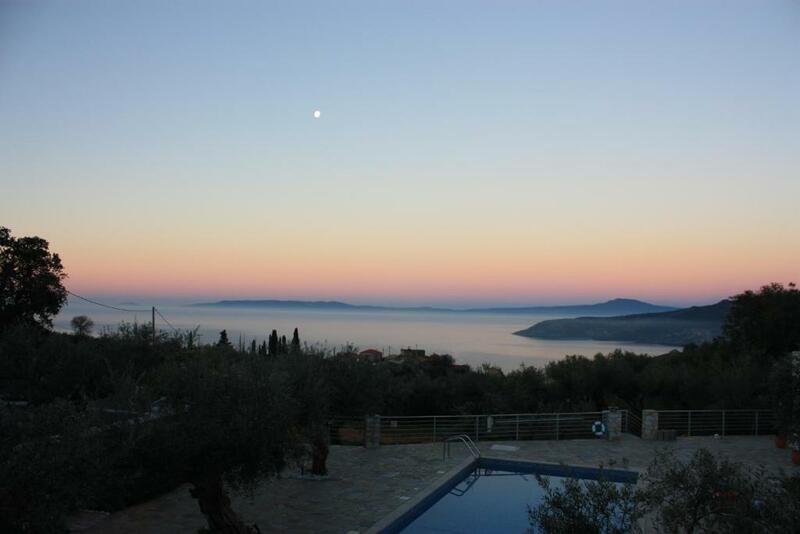 This is a wonderful place - surrounded by olive groves, stylish inside and out, wonderful hosts, and great views and sunsets over the Messenian Gulf. We couldn't have asked for more on our first visit to the Mani and Kardamyli and can't wait to go back. Not close to restaurants, bars and beaches..... more of a retreat. Great facilities but we didn't bring the food and drink...…. Marvellous Contemporary Greek Building.... very clean..... with excellent garden and pool Stunning Art. We loved our stay at Olive Tree boutique villas - and the hosts couldn’t have been more friendly and helpful. We also loved our class making mosaics with Robin. All round ace experience! Car required to get to the village. Very nice Apartment/Studio/Villa with great comfort and fully equiped. "Airy" feeling with much light. Everything is quite new and very good maintained. Great views . no noise. Relaxing atmosphere. Helpful hosts. Not right next to the beach, but short drive in a car! Friendly welcome, Robin and Ann-Marie helped out with useful directions, provided good local tips. The rooms were lovely with private patio for dinner under the stars. relaxing and situated in an olive grove on a hill. Travelled with a 15 month baby who settled in well. Delicious olive oil and jam.